Deservedly, Vacherin Mont d'Or sits front and center at a cheese tasting also featuring Fritz Kaiser's Miranda, a seven-year-old Empire Cheddar and Celtic Blue from Glengarry Fine Cheese. There’s nothing quite as exciting as tasting an outstanding cheese for the first time: Whoa! What aroma! What flavour! What texture! Where have you been all my life? We bring the curtain down on 2010 with friends in fromage recalling the memorable cheeses that crossed their palates this year. Lots of typical aged Cheddar flavour with sweet and spicy notes. Very firm and dry. 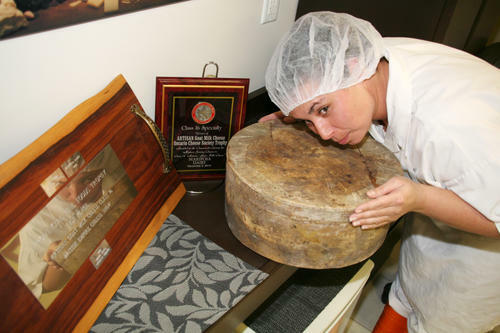 An 18-month-old, 40kg organic raw milk pressed cheese that won the Gold Medal at 2010 Quebec Caseus Awards. Federally licensed. A young 350g farmstead sheep milk cheese made with apple juice added to the curd and washed with apple juice from their own orchard. First prize in washed rind cheese category at 2010 Quebec Caseus Awards. Provincially licensed. Two treasures from maître affineur Hervé Mons. Soft surface-ripened sheep’s milk, sweet, mushroomy and herbacious. When ripe, like licking buttered popcorn from your fingertips! Georgous small cream colour curds that play on your tongue like caviar and are so fresh they sqeek lightly on your teeth. 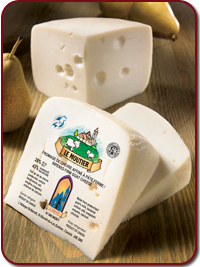 At CheeseLover.ca, the most memorable moment in cheese of 2010 came when we first tasted Vacherin Mont d’Or, a singular seasonal cheese of Switzerland that delivers an amazing explosion of aroma and taste—so rich, so gooey. Cheesemaker Fritz Kaiser, who kick-started the Quebec artisanal cheese movement in the 1980s, says Miranda is one of the many cheeses he produces that he’s most proud of. That says a lot, when one considers he makes Le Douanier, Port Royal, Raclette, La Soeur Angele, Le Saint Paulin, among others. We especially liked the rustic flavours of Miranda. Celtic Blue, Glengarry Fine Cheese, and Bleu d’Elizabeth, Fromagerie du Presbytère: Two very different blue cheeses that demonstrate how far blues made in Canada have come since the days Roquefort ruled. Three cheers for Blue Canada! There are so many fine older cheddars made in Canada, but Empire’s oldest offering stands out in memories of cheese tasted during 2010. —Georgs Kolesnikovs, Cheese-head-in-chief at CheeseLover.ca, wonders what outstanding cheeses he’ll encounter in the New Year. 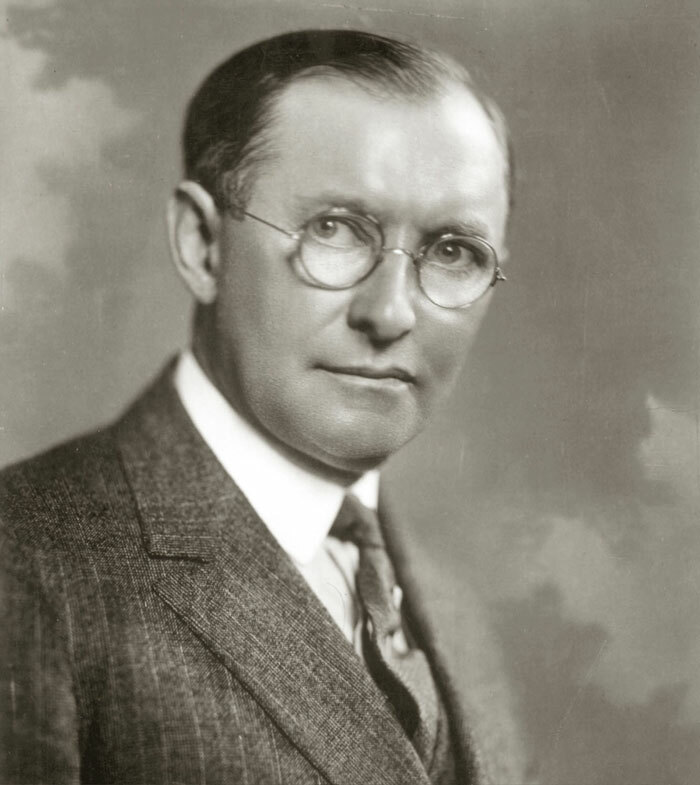 Canadian James Kraft founded the second largest food conglomerate in the world. The secret to great fudge is . . . Kaft Velveeta? Madame Fromage: Goat cheese or night cream? Cornish Blue: the greatest of cheese? 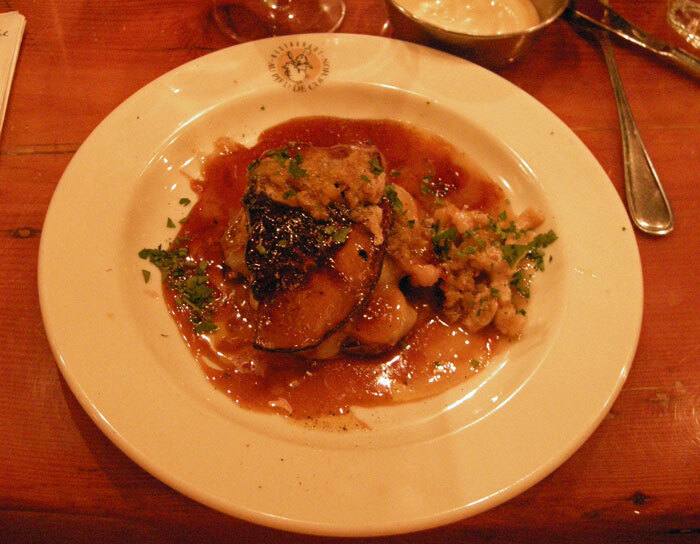 We are in Quebec for the cheese, but who can resist at least one meal at Martin Picard’s Au Pied de Cochon in Montreal? Have no fear, there is cheese in this petite poutine! 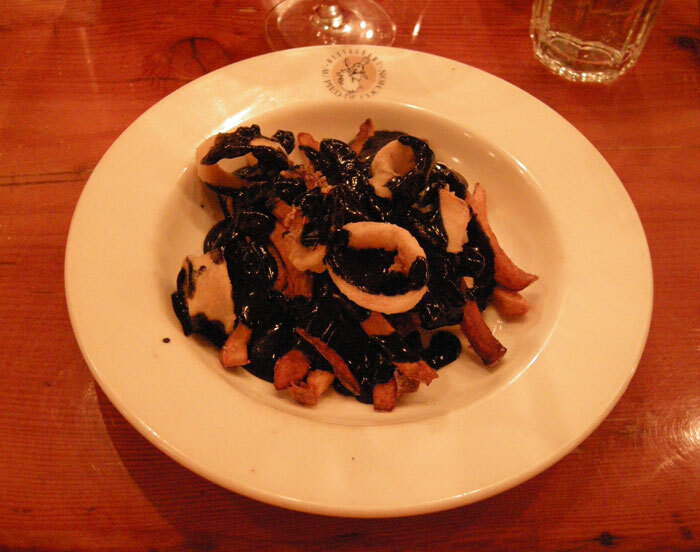 Delicious cheese curds from La Fromagerie Champêtre are buried in the potatoes fried in duck fat and smothered with calamari and a black squid-ink gravy. Let's see, how shall I have my foie gras today? Let's start with a buckwheat pancake, add slices of potato, bacon, aged L'Île-aux-Grues Cheddar, eggs scrambled in a maple-syrup reduction, and the foie gras. Voilà, that's Plogue à Champlain at Au Pied De Cochon! As Sarah Jane, our helpful waitress explained, plogue is a buckwheat pancake, made without eggs and butter and fried on one side only, popular in northwest New Brunswick. The maple syrup comes from the Chef’s own Cabane à Sucre aka Sugar Shack. The Champlain in the name of the dish is not the early explorer of Quebec, rather it refers to Champlain Charest of La Bistro Champlain, famed promoter of fine wine in La Belle Province. 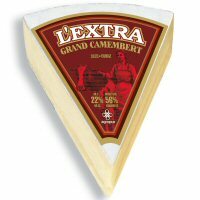 As hyperlinks don’t show in captions, here are links to La Fromagerie Champêtre and Fromages L’Île-aux-Grues. Today, we’re off to Fromagerie Fritz Kaiser to meet the man who launched the artisanal cheese revolution in Quebec. Georgs Kolesnikovs, Cheese-head-in-chief at CheeseLover.ca, has never met a foie gras he didn’t like. 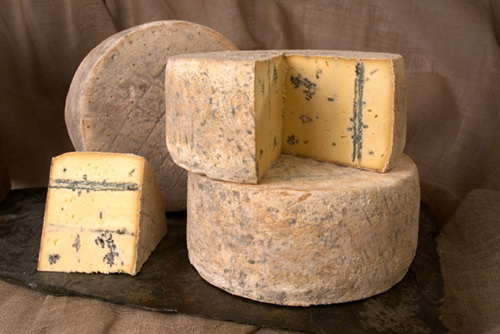 Cornish Blue: Judged the best cheese in the world in 2010. 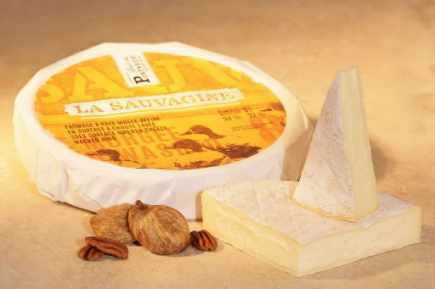 Four artisan cheesemakers from Quebec as well as Canadian cheese giants Saputo and Agropur medalled in the World Cheese Awards last week, the largest cheese competition on the planet. Hosted at the BBC Good Food Show in the U.K., 201 judges from 19 different countries judged 2,629 cheeses from 29 countries. Louis Aird of Saputo was the sole Canadian judge. 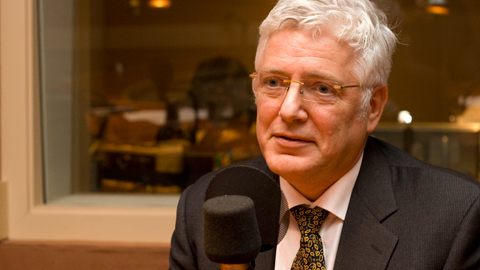 Louis Aird of Saputo: Judge at the World Cheese Awards. 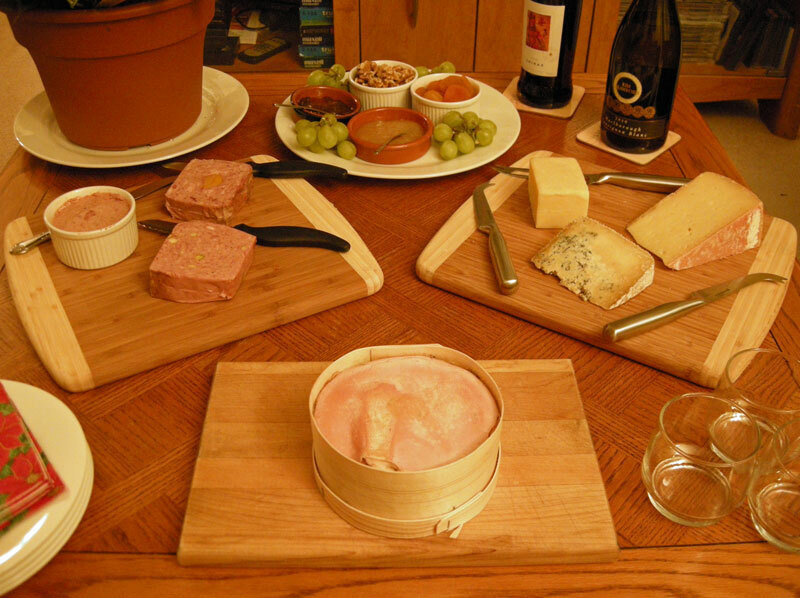 For a list of U.S. winners, visit Cheesemonger’s Weblog. The World Cheese Awards has been bringing together buyers and sellers from the dairy industry worldwide for 20 years. The BBC Good Food Show is the biggest and most cosmopolitan cheese festival ever staged in the U.K.,, with almost 100,000 consumers tasting cheese after the international panel of experts completed their judging. Rebecca Crosgrey is Event Co-Ordinator at The Great Canadian Cheese Festival. She patrols the Web for cheese news for CheeseLover.ca.